Tasted at the chateau. A blend 72% Cabernet Sauvignon and 28% Merlot raised in 50% new oak and 50% one-year old barrels. 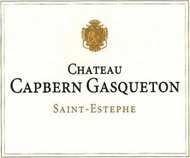 The Capbern-Gasqueton 2009 has a very precise bouquet with ample red fruits: wild strawberry and raspberry with subtle earth and liquorice notes underneath and beginning to rise to the surface with each swirl of the glass. The palate is medium-bodied with good fruit concentration, slightly chalky tannins at this stage, good tension and mineralite coming through towards the finish with blacker fruits, one again with a hint of liquorice. Nice length and persistency. Great value + great wine equals happy customer. Tasted September 2011.